Family: I love you. January will be here soon. So, I had a “feeling” today would work out but honestly, God knows best. I have a lot on my mind. I am studying for my written test which I am planning to take next week. I am waiting for my work schedule to come out so I can see what days I am off and will schedule my test then. My instructor sent me a text of encouragement this morning. It was good to hear. He assured me that I will get this done and he will do what he can on his end to work with my schedule. I really appreciate that. Well, I need to study but just thought I would let you all know. Today was a no-go due to gusting winds at 18 kts (which equals 20 MPH). Unfortunately, winds look to be the same tomorrow. God is the maker of the wind and He has a perfect plan. In the meanwhile, I will be studying for my written exam and “chair-flying” so I don’t get rusty. (“Chair-flying” just means, that you imagine all your turns, communications with Air Traffic Control and in your mind, go through the flight. It helps keep a student fresh when they can’t fly). 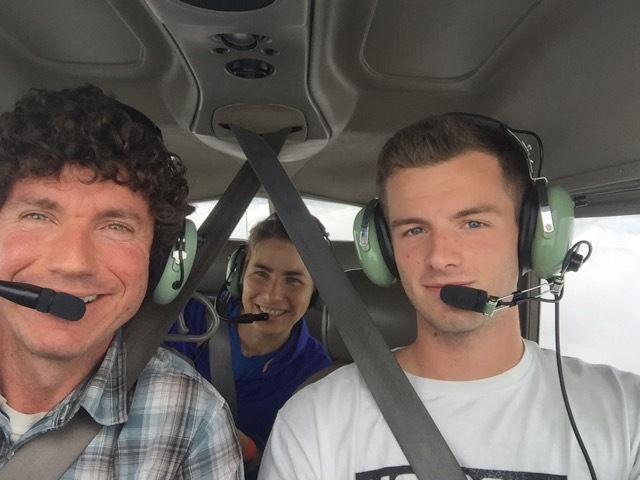 I was not able to fly my solo flight on Friday due to weather but, I did get to ride along with a student who is getting his instrument rating. That means, he gets permission to fly in the clouds. 🙂 That is the rating I hope to get next. Well, here are some pics from the day. I will try my solo flight again on Monday and if not then, maybe on Tuesday. Both days look to be promising. My instructor, Matt, on left and Scott “the pro” on the right. Great job Scott! Well, I will see you back here soon. 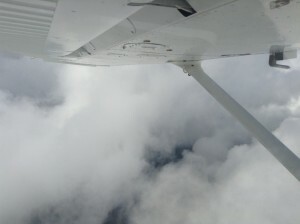 Hopefully, with pics of my flight to Cape May! Thank you all for your care. So, yesterday didn’t go so well. Those 4 letters that you never want to organize into a word. L.O.S.T. Yeah, that was me yesterday. It was a good learning experience. If you don’t recognize where you are, even after circling Robbinsville for 40 minutes, :/ you can use an instrument, called a VOR, to help you. I was reminded how to do that and it told me exactly where I was. It was great. So… after the “learning experience” yesterday and studying Google Earth, I tried the trip again today. I did well on the way there. I still struggle with the military airspaces and knowing exactly where I am but I did much better finding my items along the way that I had picked out along my route. After the flight, I thought to myself, “Well, I could do that flight 4 more times and then I would feel confident.” There was so much to do and learn. And then, my instructor said, “You did great! Are you ready to go to Cape May by yourself?” I was shocked! That was truly far from what I had in mind. My confidence had been lowered since yesterday and I assumed that Matt was thinking the same things. But, I guess not. In all reality, I am confident enough to go to Cape May. I guess that flight to PA was just a nice reality check. So, I am thinking the flight to Cape May will happen Friday but time will tell. I will be updating my blog as things progress so check back often. I don’t want to flood your inboxes but I would like you to know that the updates will be here if you want them. As a reference, I would like to share what else needs to be completed before I get my pilot certificate. 4) Written Test (I am hoping to take that test next Thursday). 5) Checkride (A fancy word for the final test. The ‘final test’ includes a flight with the examiner as well as a verbal test of your knowledge. So, there it is. I am almost done. I can almost smell it! Please stay tuned. You could also pray, as funds are getting low and I don’t want to stop now. I am so close!! !